LocalPhone Review : LocalPhone User Review | Free Pc to Phone Calls, Free Voip Calls to India International ! Yesterday we posted about LocalPhone offering free International calls to USA and Canada from anywhere in the world. I am sure many of you must have made use of the offer to make free calls on 4th July, the Independance Day. LocalPhone is one of the most trusted and most widely used voip provider. Many of our blog readers may already be using LocalPhone for their international and national calling needs. Specially, many NRI use LocalPhone for calling India. There are lots of reasons for that. I am myself using Localphone.com for quite a long time now and have been quite satisfied with LocalPhone Voip service. Update (Feb 2011): Now you can also use the following Localphone voucher code and get free bonus credit. 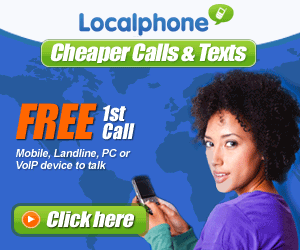 When you join Localphone, you will get first call free and some bonus credit. Your first call is free and you’ll get a $10 bonus when you top up by $15 using the voucher code NEWUSER11. New Call rate to India is just 1.59 cent per min. After bonus it will cost you effective rate of just 1 cent per min. Mr Hitesh, one of the regular readers of Free Pc to Phone calls, shares his experience of using LocalPhone. He regularly uses localphone for calling India from USA. Below is his review about LocalPhone. "I am using localphone for like last 18 months. It's a Uk based VOIP provider which offer phone calls to various destinations. First thing which I like about LocalPhone is its quality. The call quality (voice quality) is really excellent. There is no busy signal, no call drop or any voice drop sort of problem, indeed a complete peace of mind. Second thing is its easy to use service. Only one time set up is required. I am using it to call India form USA. For each Indian number they give me one local USA number. So I just dial that number and my call get forwarded to my Indian destination number. They also have local access number, so I can even call any unregistered number. Another great thing about LocalPhone is that it also give local number from other 45 countries. Third thing is that their rates are very reasonable. For e.g. to call India it is just 2.9 cent per minute. And they also reduce it periodically, when I was calling 18 months back, the rate was 6 cent per minute. Now it is just 2.9 cent per minute. So we do not have to find another cheap and better service provider. Last but not least is there are no confusing plans and fees like monthly fees, service fees, expiration date of credit, so I do not have to worry about expiring minutes or unused credit. In my opinion those who really looking for quality service at reasonable rate LocalPhone is the answer for you. " Cheers to Hitesh for such a nice review..!! PS: If you also want to share your calling experiences with us, then you are most welcomed to do so. Write me at madhur.dce@gmail.com . I also totally agree with the review. to add to above review..
Local phone does gives u a local number in many countries. Only one local number is alloted, but its very useful. Anyone can call at that number and it rings on you VOIP. This service is free. Localphone do give number from many country so you can call that local number and your call get forwarded to your destination number. just check your account and on dashboard try to change your location. you can choose many countries and city to call from. Can you please do a review on THE cheapest provider from Canada/U.S. to India? Nymgo is still between 1.8 and 2.3c. Thanks. Nymgo, you need to use by internet, thats the drawback. and charges are 1.3c on mobile to India. Quality is petty good. its my first choice, although i get some hit due to exchange difference etc. Now all we need is to be able to reach these numbers for free. Fortunately, calling Australian landline numbers is extremely cheap and even free. Most of the Betamax clones like Jumblo or SmartVoIP offer free calling to Australian landlines. If you do not mind shorter call lengths of 10 minute, Poketalk offers free calls to Australian landlines. The maximum call duration, however, is limited to 10 minutes. they are going to reduce their rate to 2.5 cent for India form 13th July GMT. so enjoy much cheaper rate. I love this. call rate for india and bangladesha are fairly low but high for pakistan. a lot of service usage limitations do also exists. I agree.. i guess the main cause is Pakistan has high disconnection charges. Voip has to pay it to the local telecom in Pakistan. Can register multiple mobile nos. can use internet to call internationally. happy about except some times cant reach the local nos alloted - getting busy message. but its sometimes. I am using LocalPhone from last 9 months. There is no doubt that they are cheep, the setup is easy. But I experienced disconnection but not quiet often. The most common issue is one way audio. Now I am experiencing the one way audio from last one week. Their support is very pathetic. Response is very slow. I have been using localphone for about a month and have several local DIDs in Europe and the U.S.. The call quality has been superb, service quick and responsive and just generally I feel extremely pleased with the company. And their rates are very reasonable too.Highly recommended, and I don't have any connection with the company! This is great that it make Unlimited Free Pc to Phone Calls, Free Voip Calls to India, Free International Calls, Free Phone Calls Worldwide, Free Mobile Calls, Free Internet Calls. Voice over Internet Protocol lets you make free long-distance phone calls using your computer including PC to mobile calls. I have been using Localphone for almost a year now and am thoroughly impressed. I used to use skype subscription with incoming numbers, but skype has no customer service and also keeps changing its pricing and plans - mainly for the worse. Localphone is fantastic: I have numbers in the U.S and in two EU countries and use a Siemens vOIP phone at home as my main phone. I also use their access numbers while out and travelling and frequently also their great system that "converts" any number in the world to a local number wherever you are. You dial a local number and it seamlessly connects you as though it were a direct call. Their website is great and configuration easy. All this at remarkably low cost that keeps getting better. I had a few issues with no ring tones to a specific number, but that was resolved quickly and painlessly by customer service. Can't say enough good things about them. they offer 5 mins free calling to try out the service, so definitely worth trying! For 3 months, I've been using localphone to call the US Virgin Islands from Florida. The receiver had some sound problems -- hearing their own echo -- so I would use my localphone number on Skype. Everything was fine -- good sound quality and all -- until recently when I started getting a recording from localphone to enter my localphone number. Then the recording would say the number was not active and my account balances is zero when I know it's not zero. If I called directly from the Localphone PC app, I could make the call but the sound quality suffers -- the same echo experienced by the receiver -- as I was before. I'm wondering why my Localphone suddenly stopped working on Skype. Has anyone else had problems using Localphone on Skype?